The Sonoran tiger salamander lives only in a small part of southern Arizona and northern Mexico. While it resembles a lizard, the Sonoran tiger salamander is actually an amphibian, part of a group of animals that were around even before dinosaurs. In 1997, the federal government added the Sonoran tiger salamander to the endangered species list to protect it from possible extinction. Their survival is threatened by disease outbreaks, limited habitat, and the introduction of fish, bullfrogs, crayfish and other tiger salamander species that are not native to Arizona. Bullfrogs and crayfish prey upon Sonoran tiger salamanders, compete with them for food, and can transmit diseases to them. The future of the Sonoran tiger salamander depends on community involvement and protecting the species on both public and private lands. Biologists at Arizona State University (ASU) began surveying stock ponds with tiger salamanders in the San Rafael Valley in 1979. Since the mid 1990’s the Arizona Game and Fish Department has extended the surveys to track population status, and has conducted conservation related activities. In 2002, a recovery plan was developed to help protect the species and reduce the threats to their survival. Like other amphibians, such as frogs and toads, Sonoran tiger salamanders are capable of surviving both in water and on land. They begin their life as jelly-coated eggs laid in water from January to April. They hatch into aquatic larvae with gills, and grow into either mature gilled aquatic adults, called branchiates, or metamorphose into terrestrial salamanders without gills. Most Sonoran tiger salamanders are paedomorphic, meaning they can reach sexual maturity and breed while still in larval form. Branchiate salamanders are specially adapted to live in the water with external gills and a crest running down their backs to help them swim better. They can grow up to 15 inches long and are olive-gray in color. 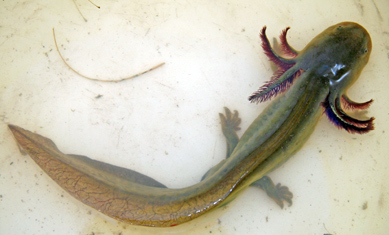 Metamorphosed or terrestrial salamanders lose their gills and tail crest and move to land, but they can also live in water. Only after they metamorphose (lose their gills and develop lungs) can salamanders leave the water. Terrestrial adults can spend the dry season living in crevices, animal burrows, and rotted logs or they can return to ponds to keep from drying out. They typically venture out at night during the rainy season and return to ponds to breed. They grow up to 13 inches long and are black with yellow spots and stripes. They closely resemble both the Arizona and barred tiger salamanders. Metamorphosed salamanders are the only form that can move from pond to pond and establish new populations following drying or disease outbreaks that kill most branchiate adults and larvae. Sonoran tiger salamanders live only in the grasslands and woodlands of the San Rafael Valley in Santa Cruz and Cochise counties in southeastern Arizona and in the most northern parts of Sonora, Mexico. The most important habitat requirement for Sonoran tiger salamanders is the year round availability of standing water for breeding, growth and development. Unfortunately, permanent bodies of water can also provide good habitat for introduced fish and bullfrogs that prey on the eggs and larvae. 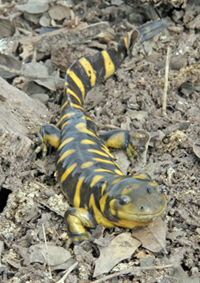 Spring-fed marshes (or cienegas) were once the natural habitat for Sonoran tiger salamanders. Severe and rapid erosion, known as arroyo cutting, in the late 19th and early 20th centuries caused the San Rafael Valley to dry, and natural standing water habitats to disappear. As a result, ponds created by ranchers for watering livestock are almost the only good breeding sites left for Sonoran tiger salamanders. Sonoran tiger salamanders feed on a variety of insects, worms and snails.